Detroit Metropolitan Wayne County - Sky Harbor Intl. Staff was very helpful - ordering and paying for a taxi for our airport ride early as their shuttle did not start until 5am. Our flight left at 520 so we needed help with accommodations earlier and they offered and helped. Second stay here, will most definitely stay again. Property is an older hotel but appeared to be recently upgraded. Some items still showed age but overall better an expected. Area is not the best part of town but no issues. Clean, inexpensive, nice pool, located near shops and restaurants. Renovated room was great, exterior was not too impressive but this hotel was just what we needed. If you'd like to package your flight and hotel options to save money, you're in the right place! Just sit back, relax and let the team at Orbitz help you design the ultimate Phoenix getaway. If you package your bookings, you can save up to $857*! Simply take your pick of hotels, airfares, rental cars and experiences. Not only that, but you'll be able to customize your getaway by picking from 500 airlines and no less than 500,000 hotels across the world. You can be as flexible as you like! There are endless available options to design your own inspiring vacation, whatever your interests, style or budget. Who doesn't like quick, easy rewards? Simply keep on booking with us and you'll get Orbucks! We've devised a simple program that rewards you quicker than anyone else. Earn platinum or gold status for perks at Orbitz Rewards VIP Hotels. How? Just book four nights for gold and 12 nights for platinum in a full year. And how do you redeem Orbucks? It's simple — you can make use of your Orbitz Rewards points on your very next booking. Getting lost in a foreign country always sounds romantic. But if you want to arrive in Phoenix on the first try, listen up. This renowned city is the capital of Arizona. It is located 2,000 miles to the west of Washington, the nation's capital. Forget the big-name attractions — it's the locals that really make a place tick. In this part of Central Arizona, you'll find 1,400,000 of them. You wouldn't want to leave Phoenix without exploring Arizona State Capitol. Catch a theater performance at Orpheum Theater and appreciate the highly talented actors. Like some more options? 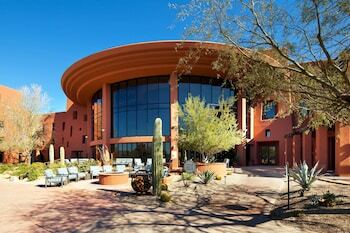 You will have a great time while learning something new at Arizona Science Center. The array of interactive exhibits and displays ensure fun for the whole family. But that's not all! Appreciate the mix of spirit and form that only art can express at Heard Museum. See the region when and how you want by checking out car rentals in Phoenix with Orbitz. Start your engines and fasten your seatbelt — it's time to hit the gas! Collect a car from the Sky Harbor International Airport area for a seamless transition to your hotel. Head to Hertz, one of the most reliable outlets in the immediate vicinity. Enterprise is found right in the middle of the city at 1225 S 7Th St. This makes it a great option for those staying central. There's no need to search hard for a place to kick your heels up in the state capital of Arizona. 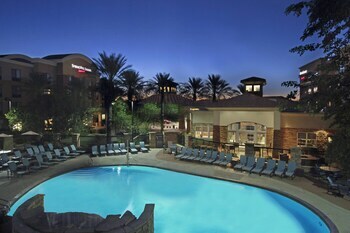 Orbitz lists 340 hotels in Phoenix, so have a browse and choose the right fit for you. On the hunt for a luxury suite? 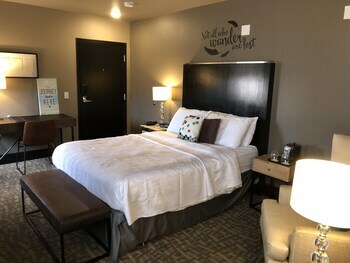 You'll feel like a movie star if you decide to stay at The Camby, Autograph Collection (2401 E Camelback Rd) or the Hermosa Inn (5532 N Palo Cristi Rd). 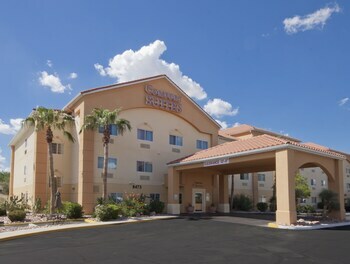 Otherwise, check out the facilities at the Best Western Airport Inn or the Super 8 Phoenix Downtown if you're traveling on a tighter budget. If you're flying in to Phoenix, you'll likely be arriving at Sky Harbor International Airport (PHX). Grab a bite to eat and get your bearings after disembarking your flight. This is the nearest airport, sitting 4 miles away from the downtown area. If you've checked out the best of Phoenix with time to spare, don't panic! Just 17 miles away is El Mirage, and there's no lack of activities on offer here. If you want to spend a whole day in this area, visit the Luke Air Force Base in the morning. Then hop on over to Westgate Entertainment District and the Wildlife World Zoo and Aquarium. Maricopa is another neighboring area located just 25 miles away. 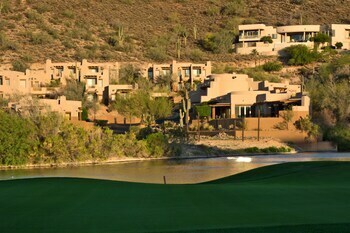 This place features the Harrah's Ak-Chin Casino, the Ak-Chin Southern Dunes Golf Club and Copper Sky Recreation Complex. We appreciate that sometimes things need to change. So, if you cancel or amend your bookings you will never get a fee from us.^ And if you act quickly, your airline or hotel might not charge either.